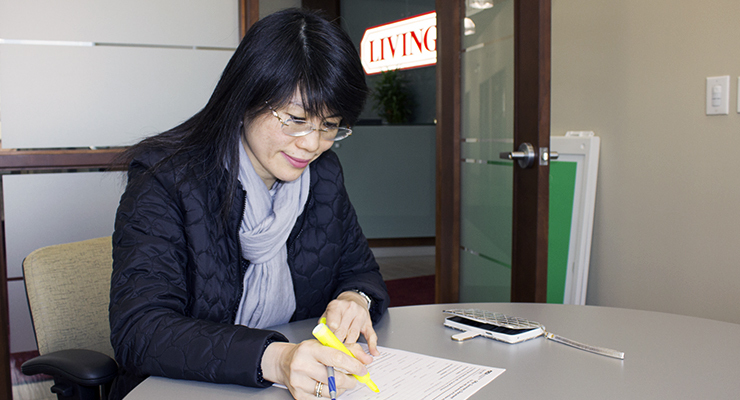 Woodbine Branch agent Christine Zhu examines an Offer Summary Document. With the high demand for real estate in the Greater Ontario Area, it has become very common for there to be multiple offers and bidding wars on properties. In turn, this has given rise to many pre-emptive or “bully” offers, with buyers looking to get in ahead of the bidding war. This situation may be unfamiliar to many people, so it is good to prepare yourself with a bit of information before hunting for a home. When a buyer makes an offer on a home, they are generally doing so with the guidance of a real estate sales representative after signing a Buyer’s Representation Agreement. Your REALTOR ® will be able to guide you through the offer process but it is important to know a few things. In order for an offer to be considered registered, it must be made in writing and signed by the party making the offer. When your written offer has been submitted to the seller’s agent (or to an appointed representative, if he/she is unavailable), that agent must inform their client (the seller) of your registered offer as soon as practically possible. This way, each buyer can have added peace of mind knowing that their offer will be considered by the homeowner directly. However, not all offers are the same. They may have different terms, such as closing date, deposit amount and, of course, the all-important purchase price. Some offers may carry conditions, such as the buyer’s right to an inspection or to obtain financing. Because those variables are dependent on the buyer’s situation, it is very important to rely on the help and guidance of your buyer’s representative when drafting an offer on a home. Although it can occur in other circumstances, multiple offers tend to happen when a specific bid date and time has been noted in a property listing. In these situations, any interested buyers (or their representatives) must present a bid in writing by a specific time. Afterwards, the seller and their agent will review all those bids. From that point, the proceedings can vary. Sometimes sellers will accept their preferred bid straight away. On other occasions, buyers may be given the chance to increase their bid in a second round of bidding (generally, the two or three with the highest bids will be given this chance). This may then be repeated with a third round of bidding. Generally, additional rounds of bidding are used when two or more bids are very close to each other, although it can also be used by some agents to try to increase the selling price. This process can be very time consuming, usually continuing for several hours, unless there is a clear winning bid very early on. Multiple offers can occur even without a bid date. If more than one buyer submits an offer around the same time, it will create a multiple offer situation. This does not necessitate that there is a “bid”, as described above, but it does indicate that your offer should be as strong as you can make it, to try to ensure a winning attempt. Start off with your highest bid – There is no guarantee that there will be a second round of bids, so start off by offering what you are prepared to pay (and as much as you think the house is worth). It shows that you are a serious bidder, can encourage the seller to avoid multiple rounds, and saves you having to agonise over further rounds of bidding (if the bidding goes to a second round, you know that the house is out of your price range). It also helps you avoid the unfortunate situation of presenting a lower bid and then losing the bidding war to someone who offered less than you were prepared to pay. Remove conditions – If two bidders offer the same amount but one has conditions and one doesn’t, the seller will likely accept the condition-free offer. It saves them time, money, hassle and the concern of the deal falling through. Removing conditions comes with its own risks. You should get the appropriate guidance from your agent and other professional counsel, like a mortgage broker, if you plan on removing a financing condition. Pay attention to the seller’s demands – Different people have different demands when selling a home and it is worth paying attention to them. Perhaps they are keen on a quick sale, so showing you can close quickly might give you an edge. On the flip side, they may want to remain in the house for an extended period and showing you can accommodate that could help you. Maybe they are looking for a particular kind of buyer, with sellers sometimes hoping for a buyer who will care for their much-loved property. In short, find out exactly what the seller wants and then tailor your approach and bid to meet their needs. The extra work could bring great rewards. Have a good Realtor – A real estate agent who has experience in bidding wars – and winning them – can give you a great advantage. This is especially true if they are familiar with the area and the selling agent, as they will have a good idea of how the bidding process will go. Make sure you have a deposit cheque – Once a seller has accepted your offer, they want to know you are going to go through with the deal and the best way of showing this is by giving a deposit cheque on bid night. If you can’t provide this but the next bidder can, the seller may well decide to go with the second-best offer and you will have the heartbreak of being so close, yet so far. Go for a hail Mary – When all else fails you could try something different. For example, in this recent story, a family bid $150,000 lower than the top offer but their bid was accepted after they sent a moving letter to the sellers. We have to point out that there is a good reason that this story made the news: it doesn’t happen very often. So, don’t make this a major part of your strategy in a bidding war. The term bully offer (AKA pre-emptive offers) refers to an offer that is made before the offer date initially set by the seller(s) and their agent. Generally (but not necessarily), bully offers present a sum higher than the asking price, and are submitted by competitive buyers with a serious interest in the listed property. For a buyer, this can have various benefits. Firstly, you avoid a potential bidding war, which could push the price further up. It also takes out any of the pressure and uncertainty of a bid night. Perhaps most importantly, you can try your best offer and if it is rejected, you don’t have to waste further time trying to bid on the bid night and can move on to another property. On the seller side, the benefits are a bit less clear. If you are looking for a quick sale then a bully offer could be just what you need. You may also find that you receive an offer beyond your expectations, without the risk of waiting for a bidding war. However, some people would argue that accepting a bully offer is a bad deal for a seller because the bidder has already shown how much they are prepared to spend and they are likely to come back with the same offer on bid night. If that is the case, waiting until bid night will net you at least the same amount, but potentially more. The best way of knowing whether or not to make a bully offer on a home is to ask your real estate sales representative – they have the experience and expertise to be able to read the situation, and figure out when to time submitting your offer on a property. The same advice applies to sellers, who should check with their agent before setting an offer date, and before choosing to entertain any offers that come in earlier. For detailed information on the regulations regarding competing offers, conveyance of offers, and the changes to the offer process effective July 2015, we encourage you to check out the official Real Estate Council of Ontario (RECO) website at http://www.reco.on.ca/.